“Shasta Shutterbug” . . . a must have at your next event! “Shasta Shutterbug” camper photo booth was an idea I saw online from California and Florida. My niece had sent a couple of pictures to me, and I started to research. It’s also something popular in Europe. Most of those are from the back of a VW bus or a similar vehicle. I initially saw this 1969 Shasta Compact Camper for sale about a year ago alongside a local road. Not knowing what I could do with it, I somewhat shelved the thought of buying it. After I had seen these ideas online, I knew I needed that “Shasta”. I was sure it was gone eight months later. I took a 15-minute drive where I saw it previously. There it was still sitting there waiting for me. I immediately jumped on the idea. I purchased the camper and started looking at different ones all over the US. There are not many out there, but I think it will grow. I never realized how big photo booths are. I shoot many weddings throughout the year and starting noticing the appeal. I figured photo booths would be more of a short-term fad and dwindle away. Not true! They are getting more and more popular. So this was my winter project! Not having any idea what to do, I had my daughter, Courtney, do the designing as I did the engineering and labor. My 21-year-old daughter knew what was “in” more than I did. She was attending UD while I worked on it and came home to check on it (and my work). I was blessed with a relatively warm fall and winter. I gutted it. You never know what’s underneath until you start pulling it apart. I replaced some rotten walls and rotten floors from 47 years of weathering. Put new ceiling and wall coverings with a hardwood floor. It is decked out with a stereo system inside and outside. 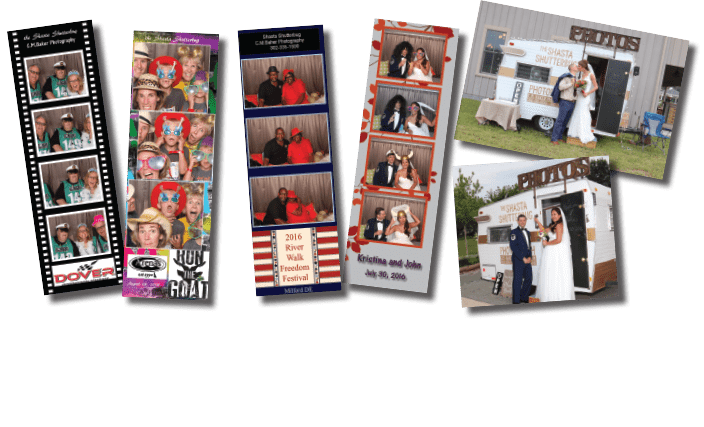 The photo booth is built to fit in the area that is left. For advertising purposes a corporate or company logo and/or text can be printed however the client wishes. These pictures always hang around and the company info is right there with it. Endless possibilities ! We are booking many weddings for 2017 and are very excited with the incoming year of 2017. Prices can be obtained by contacting us on our website at www.cmbaker.com. Call us with any questions you may have. We cover all of Delaware and parts of neighboring states.